Super Plumber Run. Run and jump through a challenging world in this addictive platform game with a twist! 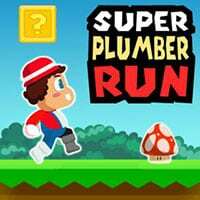 Join the super plumber and try to get a far as you can. Jump from platform to platform, avoid obstacles and smash your enemies! Collect mushrooms to grow and become invincible, fly high into the sky or go deep down and bounce through the subway system. Gather coins to upgrade power-ups in the shop and try to complete all missions. This game can be played on all devices. Enjoy and have fun. Super Plumber Run is a free online action game on Round Games.